Operation Trashing : We need to recognize that this ID ability is dependent on the use and frequency of operations in your local meta corporation decks. Against an average by-the-book corporation deck, operations tend to exist at around the 9-10 card mark. Certain Weyland and NBN builds will go as high as 14 or 15, while any of the corporations (though most often Jinteki or HB asset-focused builds) may rarely elect to have less than 8. Right now with Valencia in the meta, Corporate currents are being pushed highly, and this will likely only continue to be the case as the power levels of those cards (and Runner currents) rises in sympathetic waves. This means that the higher end of the scale is more heavily weighted, in my opinion. In this sense Edward is in a good position already: ignoring the high and low ends of the scale, on average his ability is likely to be able to trash roughly 1 out of every 5 cards accessed from HQ and R&D (9-10 operations in a 49 card Corp deck assumed). For many people, I suspect this is where analysis of Edward Kim ended. His ability seems certainly interesting at just this stage, but it's not got nearly the zing of Noise's systematic meltdown of the corporate deck, MaxX's flood of cards from your OWN deck, or Valencia's guaranteed potential with the powerful Bad Publicity-enabled cards. This is a mistake, as Edward gives you access to several intangibles that are not immediately obvious but nonetheless are nearly as powerful as the face-value effect of his ability. Face-Checking : Ed has possibly the strongest central server face-check game of any Runner ID currently in print, perhaps tied with Gabe Santiago, who provides no contest vs. R&D. The best play for corporations in a world defined by ICE destruction, surprise multi-access events and Account Siphon is to avoid rezzing ETR ICE over R&D and HQ for as long as possible. Edward Kim dramatically skews this consideration over both R&D and HQ by promising a much greater probability of a punishing access that denies them cards that offer Economy (Hedge Fund, Restructure, Sweeps Week, Celebrity Gift, Successful Demonstration), Board Position (Oversight AI, Housekeeping, Enhanced Login Protocol), or even their Win Conditions (Biotic Labor, Scorched Earth, SEA Source, Trick of Light, Neural EMP, Psychographics, Midseason Replacements.... need I go on?). Operations are the lifeblood of corporate decks, the glue, the nutrient-rich solution inside of which ICE and Assets and Agendas are able to function. When those three basics break down, many corporations rely on Operations to win the game for them. Edward threatens the death of corporate operations with every single random access he makes against the two big central servers, and in so doing he demands ICE rezzes in the early game. In the faction that owns Parasite and the new Cutlery ICE destruction cards, this is an excellent psychological advantage to possess. Played properly Edward can place the corporation on the back-foot in their mind, even if he fails to trash a single operation with whatever early accesses he makes. Central Digging : Operations that are hammer-smashed out of HQ and R&D are one less card for the corporation's Agendas and their more vulnerable Assets to hide behind. Edward is the strongest identity in the game for repeated central server multi-access, because once every turn he has a decent likelihood of clearing away an 'ablative' operation card. In a hypothetical game where Edward Kim installs a new Medium or Nerve Agent, it's entirely possible that the first card he may see on the attacked central server may be an operation (if it's not already either an Agenda or trashable Asset/Upgrade). If that's the case, the subsequent 2-card access he runs is guaranteed to be 2 cards that he hasn't seen before. Guaranteed multi-access with HQ Interface is very threatening with this identity because it crushes a category of card that corporations could normally rely on to shelter agendas and vulnerable assets/upgrades in their hand. 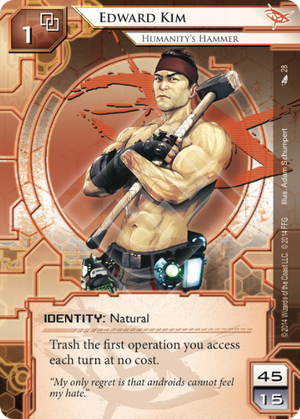 Surviving the Flatline : Nearly every flatline deck relies on Operations to close out the game (even if that operation turns out to be one or more Neural EMPs to finish the job that a Ronin started). In combination with pleasingly-thematic card I've Had Worse Edward seems unlikely to bother with the previously nigh-mandatory Plascrete Carapace most Runner decks have been forced to include. Being such a tough character is, of course, also a boon against Jinteki decks that seek to inflict tick net damage and benefit from the click compression of Runners drawing back cards to fill their health bar. The final question you're likely to be asking is, What kind of deck does he do well in? Well, that is the catch. Edward does not give an economic boost to your deck: A truly powerful Edward Kim deck could be a force to behold, but unlike most top identities he does not offer a helping hand to get your game set-up. His ability seems to want solid running economy powering a straightforward and fast rig, but Eater and the various "instead of access" cards it supports are a complete nombo with Ed. Account Siphon, Vamp, and other economic denial cards are probably great for him because you'll already be denying the corporation cash from trashing their economy operations. Imp can put even more pressure on then it normally does, since Edward will on occasion save you counters you might have spent on operations in centrals. This allows Imp to focus on getting rid of ICE and expensive assets or upgrades. Flexible pump icebreakers for the Sentry and Code Gate categories are likely splashes. Sneakdoor Beta could be a very strong surprise to flank the corporation's ICE and start wrecking operations from HQ all over again. You'll need a strong economy backing things up though because you need to create accesses on the central servers to see a benefit from Ed, and his ID ability just doesn't offer anything to get you there. With all the noise about MaxX: Maximum Punk Rock chaos and solid Bad Publicity play that brings Valencia Estevez: The Angel of Cayambe, the third identity from Order & Chaos may look less exciting. Nothing futher from the truth. Edward Kim opens brave new levels of threat that corporations must react to. Remember how many times before you didn't rez ICE on HQ, beceause there was no agendas in your hand? Just some Scorched Earth or Restructure waiting to be played? Yeah, Kim will take care of them. Without the Imp. This is the same with R&D - do you really want to not rezz your defences there so he can trash your Celebrity Gift or Biotic Labor for free? Yeah, that what I thought. Corporations must react, because Kim can easily destroy any combo play they were preparing in their HQ. That Wayland looked very manacing until he lost all the Scorches. Sorry for your lost Midseason Replacements NBN. Not. Kim is a new threat for R&D and HQ. And this is something that can't be ignored. With the rise of decks based around Jeeves Model Bioroids as the premier Fast Advance option since the restriction on AstroScript Pilot Program, is it now Edward's time to shine? Since Jeeves decks tend to focus on Operations to install and advance agendas, he seems very well placed to cause problems for them. Sniping key Lateral Growths, Shipment from SanSans or Biotic Labors forces the corp to play fair or aggressively ice their central servers - leaving them less protection available for the Jeeves remote. Add in the fact that he has native access to the Anarch breakers and tricks we all know and love and we could be seeing a new player in the latest metagame. First, something multiple people have commented on, is that Kim is like a second Whizzard. Only IMO Edward Kim is a better all rounder. Both Whizzard and Kim are best complimented by Imp. Whizzed uses Imp to trash things that aren't assets and Kim the other way around. Now this is why I think Kim is a better all rounder. Every corp uses operations, or at least for their econ. I've already won a few games against Jinteki and Weyland because I sniped their Celebrity Gift and Scorched Earth out of their hands. Sure they can Jackson it, but that wasn't part of their plan. That is incredibly annoying. For everything else (most notably assets), Kim will use Imp to trash it. I have to add though that this doesn't mean Whizzard is a worse version of Edward Kim, far from it. When you encounter a deck that uses a lot of assets, Whizzard shines like a blazing sun (I'm looking at you Near-Earth Hub). Which is best is entirely dependant on your meta. Secondly, to maximise on Kim's ability you have to ignore a large part of Anarchs greatest (or most fun) cards. By this I mean, you can't use cards that say: 'Instead of accessing, you may trash.....' It doesn't mean you have to avoid it entirely, but when you think about it is kinda a waste when you make a Keyhole run, acces 3 operations and get to trash one of them. Kim could already do that without Keyhole! You might as wel have used the to install a Medium. Same goes for cards like Eater and Wanton Destruction. You are ignoring his ID ability and also spending extra clicks on cards you could've trashed yourself (and also see, because Wanton happens randomly). With this in mind you could say Kim is a little dull, but far from it. He is just less punk rock than MaxX and doesn't have such high virtues as Valencia Estevez. He is just pissed and gets the job done as steady as a rock (or hammer....).